Browse: Front Cover | Copyright | Table of Contents | Excerpt | Index | Back Cover | Surprise Me! Buy this book with Smalltalk, Objects, and Design by Chamond Liu today! 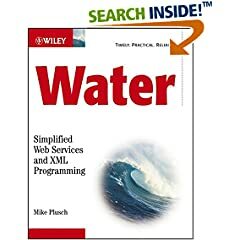 An in-depth guide to Water, a general-purpose programming language designed to build services and applications for the World Wide Web and for stand-alone programs. Written by the co-creator of the language, text includes hands-on tutorials and over 1,000 examples which include the source code and output. Organized into six parts, including Programming, Tools, and Interface. Softcover. Seems easy to understand and implement. I like the fact that it's based on XML and I agree with the author's arguments about XML being overcomplicated due to the attributes/object confusion. His conciseXML model is a good idea even if you don't use the language. Of course the success of any new language is the creation of a large community of users. Amazon customers talk about this product and related topics.